Just before the first new potato harvest, I paid a visit to Richard and Judy Cato, whose superb potatoes have been a highlight of the local farmers’ markets. We walked out into one of Richard’s potato fields. They could do with some rain, he said. This has been a very dry year. “Cato’s potatoes” aren’t organically certified, but they’re as good as. They’re grown using biological farming methods. Richard’s philosophy is to feed the soil rather than the crop. Every year he gets the soil tested and then adds what’s necessary to bring it up to optimum condition for growing great potatoes. Some of the products he uses include BioAg’s Soil & Seed, Agrisea’s seaweed fertilizer, and Moana fish fertilizer from Pacific BioFert. There’s a huge difference between the Catos’ potatoes and most commercially grown potatoes. Conventionally potatoes are grown using a wide range of agricultural chemicals, most of which are toxic to humans. 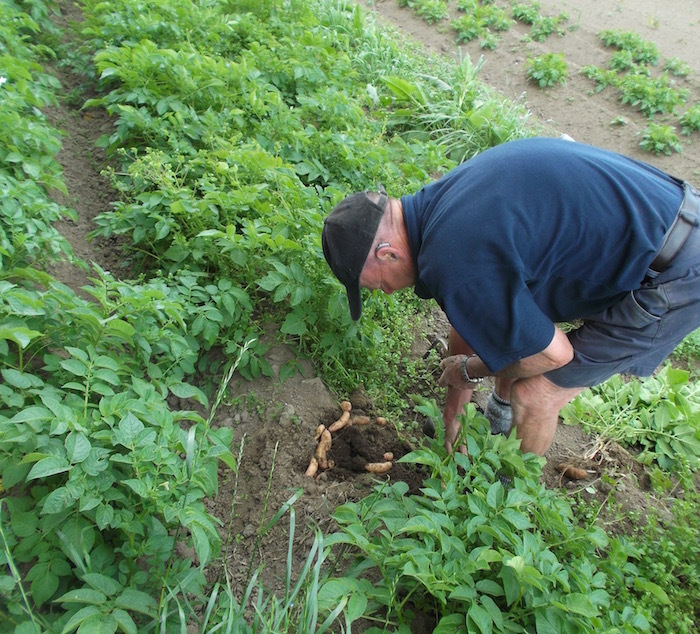 New Zealand gardening writer Wally Richards strongly advises buying organic potatoes, if you don’t grow your own, because of the chemical residues, that build up in the soil over years of cultivation, and end up in the potatoes. The United States Pesticide Data Program found residues from 35 different pesticides on conventionally grown potatoes. And here’s how some commercial growers harvest their potatoes: a herbicide is sprayed on, to “desiccate” the foliage before the potatoes are dug up. (I really didn’t want to hear that!) Richard Cato has never done this. He mows the foliage before digging up the potatoes, using machinery. “With new potatoes you’ve got to be really careful,” he said, because the skins are fragile. Richard and Judy are veterans of the horticulture business. For 20 years they grew cut flowers and hydrangeas for export. But the hydrangea flowers were wiped out by an unusually cold October, five frosts in a row. “We went from exporting 20,000 hydrangeas a year to nothing.” So they ended up growing veges instead. 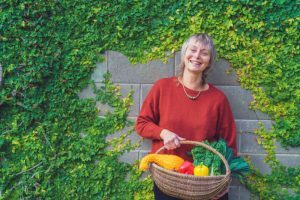 They’re especially known for their great potatoes and garlic, but they’ve also grown broccoli, cabbages, carrots, and many other veges. Richard Cato checks some early Pink Fir Apple potatoes – they still have months of growing to do. Potatoes can be a year-round crop, Richard says. In 2013 he was harvesting potatoes all year. Other years, he’s dug the potatoes and stored them in wooden boxes on the ground under the trees, covered with breathable compost covers. This low-tech storage system works well, he says. The varieties Richard grows are chosen for their resistance to pests and diseases, as well as harvest timing. He used to grow Rua, but the Rua seed potatoes are full of viruses. I went home with a “treat bag” full of three different kinds of freshly dug new potatoes. As well as Anushka, there were pink Heathers, and some long, knobbly Pink Fir Apples. They all tasted wonderful, but I can see what he meant about the Anushka. Put them in a pot with cold water. Add a pinch of salt, a handful of mint, and bring to the boil. Boil gently for 7-8 minutes. The Anushka are so creamy that you just about don’t need butter with them.